When you look at a sunflower, you can’t help but smile. There’s just something about those bright, larger-than-life flowers that really brighten up the day. That’s why every summer and fall, we love putting a sunflower spin on our famous buttercream frosted cookies! 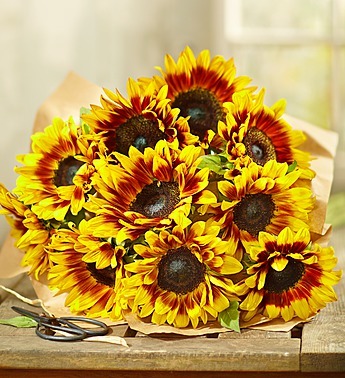 In honor of one of our favorite vibrant blooms, here are some fun facts about sunflowers! – Sunflowers belong to the Helianthus genus. Helianthus is a combination of the Greek words – “helios,” meaning sun and “anthos,” meaning flower. – The sunflower has been cultivated for over 4,500 years! -While the sunflower is native to North America, its popularity as a cultivated crop began in Russia. – It is a very fast growing plant; in fact, it requires around only 100 days from planting to reach maturity. – Flower heads from young sunflower plants actually follow the movement of the sun during the day. This behavior is known as heliotropism. – Sunflower plants vary tremendously in size; they can be as small as three feet and as large as eighteen feet in height. – One single sunflower can have up to 2000 seeds – that’s a whole lot of snacking! – There are more than 60 different kinds of sunflowers growing all over the world. – Not only are sunflowers the state flower of Kansas, but you can find 11 different varieties of sunflowers growing in this one state! – There are 2 different kinds of consumable sunflower seed – striped and black oil. – As of 2014, the tallest sunflower in the world belongs to Hans-Peter Schiffer from Germany. His wow-worthy bloom measures at 28 ft, 8.49 inches (8.75 m) high and was measured on August 27, 2013. – On the flip side, according to the 1996 Guinness Book of World Records, the smallest sunflower ever grown measured at only 2 1/5 inches at its mature stage – that’s one petite plant! – Not only can you eat sunflower seeds, but you can even use them to make medicines, paints, and cooking oil. – Sunflowers are more than just plants, they are art! In fact, famous painter Vincent Van Gogh was so inspired by this beautiful bloom that he did a whole series inspired by and featuring sunflowers. 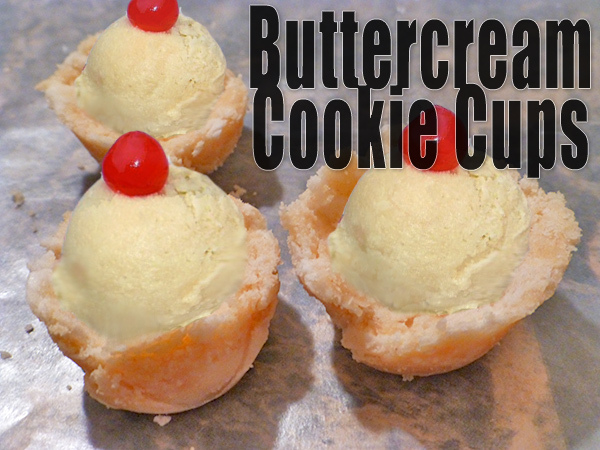 Looking for a new, fun way to enjoy your favorite Cheryl’s buttercream cookies? 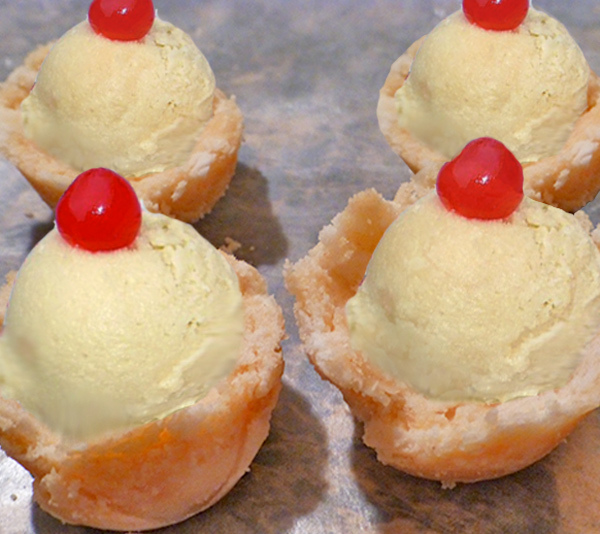 Give them a creative (and delicious) twist by turn them into bite-sized cookie cups which can then be filled ice cream or other tasty treats! Keep in mind when gathering your supplies that one Cheryl’s cookie will yield two buttercream cookie cups. We use original white frosted cutout cookies, but if your celebration calls for a specific color theme, feel free to use one of the other buttercream frosted cutout varieties to fit the rest of your menu and decor! First, prepare the cookies by unwrapping them. If you have been keeping them in the freezer, give them 5-10 minutes to defrost and soften back to their original state. 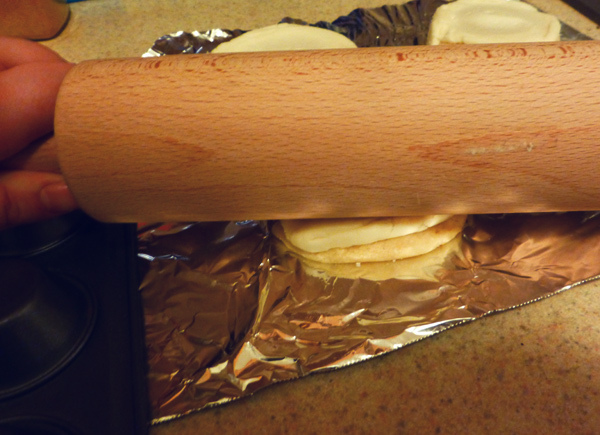 Place your cookies on a clean, lined surface and use the rolling pin to slowly flatten and crumble the cookies until you are left with a deliciously crumbled cookie pile. 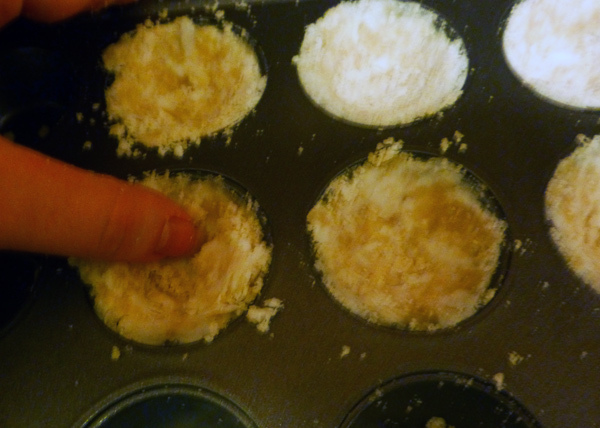 Take a handful of the cookie crumble and place on the inside of the muffin tin. Use your hand to mold it to the tin shape, using your thumb to leave an empty space in the middle to ensure the bowl-like shape. 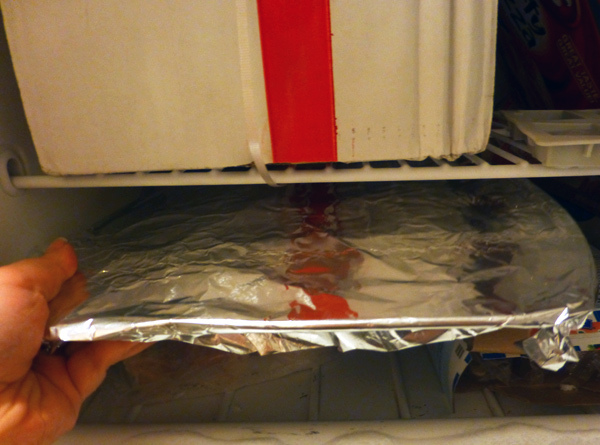 Once your entire tin is filled with cookies, wrap in tin foil and place in the freezer for 2 hours to overnight. 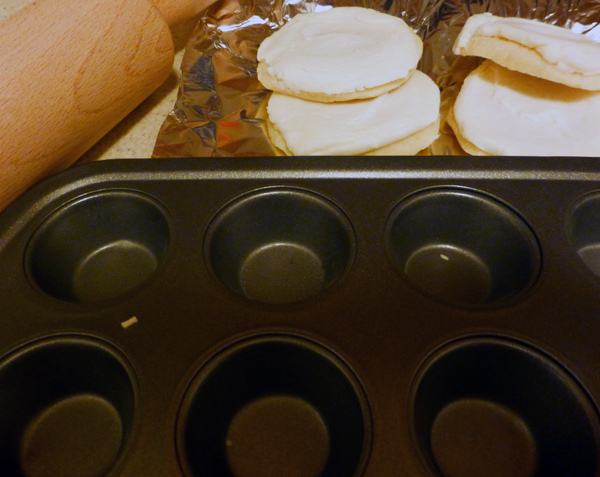 Once the cups have fully frozen into the shape, remove them from the freezer. Let defrost for 2 minutes before removing them for easy removal. Now, fill your cups with ice cream, candies, chocolate morsels – the possibilities are endless! What’s in a name? That which we call a sugar cookie by any other name would taste as sweet….The history of sugar cookies is one filled with various names, versions, and recipes depending on the country, but all have a common factor; they are a slightly more subtle version of their sweeter and more popular cookie brothers and sisters. 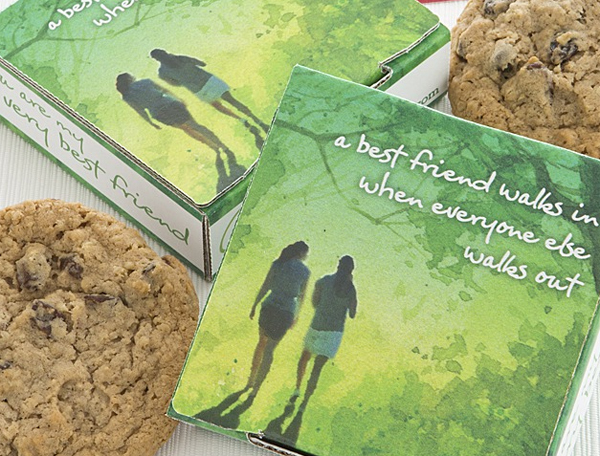 It’s no secret that we at Cheryl’s love anything and everything having to do with cookies. Since National Sugar Cookie Day 2014 is Wednesday, July 9, we’re celebrating by sweetening our day with some cool cookie knowledge with the history of sugar cookies! T here are several different theories about how the modern day sugar cookie came to be. The one that describes the sugar cookie that we in the U.S know today can be traced all the way back to the 1700s to a group of German Protestant settlers in the colony of Nazareth, Pennsylvania. The settlers created a “round, crumbly, butter cookie” which required only the most basic baking ingredients and was easily shapeable. The cookie’s easy of creation and simple yet irresistible taste made it a unanimous hit, so much so that it remained a vital part of Pennsylvania’s culture and history throughout the ages. On September 5, 2001, the Commonwealth of Pennsylvania established House Bill 1892, adopting the Nazareth Sugar Cookies as Pennsylvania’s official cookie – talk about a sweet ending! Like a long awaited friend, the summer season has returned with the first official day on June 21st! This year’s first day of summer falls on a Saturday, which means an extra sweet celebration is in order! Kick off the season with a day full of fun in the sun with these family-friendly ideas for celebrating. Invite the neighbors over for a cookout. Heat up the grill and throw some juicy steaks and burgers on for the occasion! Plant a summer seed. Celebrate the birth of a new season by planting a seed! This is a great family activity the kids have most likely never experienced, and will teach them about the cycle of life and growth as the seedling turns into a beautiful plant or tree. Have a first-day-of-summer campfire. Gather some firewood and invite the neighbors for a celebration filled with fresh air, relaxation, and s’mores! Before you party, be sure to check out Celebrations.com for your summer campfire party essentials and recipes! Make shirts for the summer. From cut out to tie dye, there are countless ways to DIY your own summer shirts. Grab a variety of plain shirts in different sizes and colors at your local craft shop and throw a shirt party! We recommend making a few beforehand as inspiration for your guests. It may be Saturday, but have a sundae party! Set up an ice cream bar with all the necessary accoutrements – several flavors of ice cream, a generous variety of toppings, and enough bowls and spoons to go around. Alternatively, if you have an extra long bowl ready, you can create your own extra-large sharing sundae for everyone to dig in and share! Chill out with a pool party. Invite friends and neighbors over for a relaxing and cool day in the pool! If you don’t have your own pool, consider organizing an event at a local hotel, youth club, or water park. Call ahead of time and see if you can reserve a spot for your party. Organize an outdoor game night. Put a fun summer twist on game night by hosting it outdoors! From cards to board games, there’s no shortage of options for family-friend games. If the night promises to be extra windy, you may want to consider having several paperweights to hand out. Have fondue fun in the sun. While fondue is always fun, the summer heat can sure make it difficult to party with chocolate. That’s why we’ve come up with the perfect alternative: icing fondue! Learn how to set up your own icing fondue set up here. They stay up chatting, gossiping, and consoling with us until the wee hours of the night. On our birthdays, they sing the loudest, eat the most cake, and tell the most embarrassing stories. Some may call them crazy, but you call them your BFF. Make up a secret handshake. You’ve been friends for how long and don’t have a secret handshake?! Incorporate high fives, dance moves, and even your favorite sayings and work together to come up with a one-of-a-kind handshake the two of you can cherish forever. Create Sweet Cookie Messages. Roll up those sleeves and spend the afternoon decorating Cheryl’s famous cookies with our cookie decorating kit, which includes 24 unfrosted cut-out cookies, 2 pounds of frosting, and festive sprinkles for a deliciously fun best friend activity! Make a sharing-sized ice cream sundae! Summertime and living’s easy… so celebrate your BFF with a mouth-watering sundae to share. Load it up with a mix of both of your favorite toppings, top with two cherries and dig in! Make a music video. Set up that web cam, blast your favorite mutual song, and bust out those dance moves! With a little bit of video editing, the two of you can have a show-case ready music video to show off (or never speak of again). Make a friendship timeline – physical or digital. Highlight the most memorable and important milestones of your friendship on a timeline! Point out dates + photos such as first day we met, first time at a concert, first time we raided each other’s refrigerators, etc. Create this on poster paper for a timeline you can use to decorate or create a virtual one on a free presentation site and share the link with friends! Marathon of Best Friend Flicks. Spend the day with your BFF, snacks, and your favorite Hollywood besties. From Pretty in Pink to Sherlock Holmes, there’s no shortage of quirky duos to spend the day with. Best Friend Interview. You may think you know everything there is to know about your BFF, but there is always a story or two you may not have heard. Jot down 10-15 questions – ranging from something as simple as “what is your favorite food” to something as complicated as “where do you see yourself in 15 years?” Hold on to these answers as you never know when they may come in handy. Spend the day giving back. Let others reap the benefits of your amazing friendship by grabbing your BFF and volunteering at local organizations to help give back – guaranteed to make the two of you grow even closer together! Fun, Easy and Delicious Ways to Celebrate National Sugar Cookie Day! Happy National Sugar Cookie Day! Today, we honor everyone’s favorite sugar-coated treat. To help you celebrate the sweetness, we came up with a few fun, simple and absolutely scrumptious ways you can enjoy the tastiest sugar cookies of them all: Cheryl’s cutout cookies! For all you traditionalists out there, whip up a quick and simple sugar cookie snack that allows you to both savor the flavor and express your creativity! All you have to do is get your hands on some rich and delicious buttercream frosting in your favorite flavors, spread it generously over a fresh batch of cookies, and top it all off with colorful sprinkles. With just these three ingredients, the cookie-decorating possibilities are endless, so let your imagination run wild! Can’t get enough cookie? For even more sugary sweetness in every bite, take your sugar cookies to new heights by stacking them with layers of buttercream frosting in between. Just lay a cookie flat on your plate, spread some icing on the cookie and lay another cookie right on top. And you don’t have to stop at just two cookies: Keep moving up until your cookie sandwich has reached the towering height you desire. 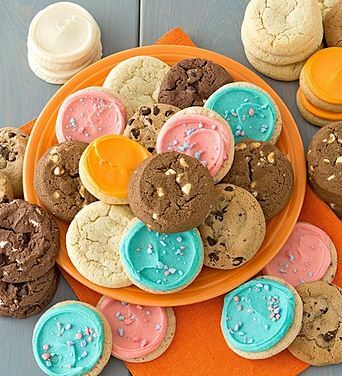 You can make things even more interesting by alternating the frosting flavors between each cookie layer! A sunny holiday calls for a refreshing sweet treat, so why not pair up your sugar cookies with another summertime favorite: ice cream? Making your own DIY ice cream sandwiches is beyond easy, and they’re a huge hit at any outdoor party. Follow the same steps you took to make the buttercream cookie sandwiches, but replace the frosting layer with a scoop of ice cream. Whether you fill it with classic vanilla or outrageous Rocky Road ice cream, this cool summer treat will make your taste buds scream for more. Everything tastes better covered in rich, velvety chocolate, and that goes for sugar cookies too! Instead of dipping the usual strawberries in your fondue pot, jazz things up and use Cheryl’s cookies instead. Or, if you’re looking for a really out-of-the-box way to dunk your cookies, check out our blog post on how to make easy icing fondue. Add even more fun to your fondue dessert with delicious toppings like shredded coconut, candy-coated chocolates, crushed peanuts, and more. In just a few minutes, you’ll have a dessert worth celebrating! 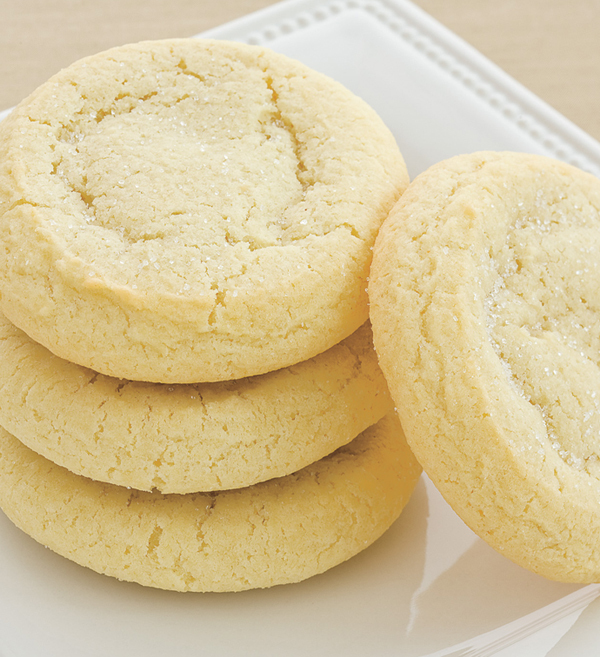 How will you enjoy your Cheryl’s cookies on National Sugar Cookie Day? Step right up, step right up! For a kid, a sunny summer day just isn’t complete without some fun carnival games. But why waste time driving to a faraway festival when you can bring the boardwalk to your own backyard? In celebration of Cheryl’s new carnival-themed cookies, we put together a list of the best games you and your kids can play at your next carnival party. So come one, come all and enjoy the most exciting fair in town! Test your pitching skills with a tossing game—DIY style. Making everyone’s favorite summertime game set is easy and cheap: Just grab a spare wooden or plastic board, cut out a few large holes, decorate it and assign numbers to each hole. Then lean it up against the fence and take turns throwing baseballs or bean-filled bags to rack up points. Your carnival party crowd will be popping with excitement when they see your homespun balloon dart board. Hang up a large corkboard panel on the fence or stand it up in the grass. Then, completely cover it with air-filled water balloons. Hand your guests five darts and tell them to take their aim: Whoever pops three balloons wins a prize! One of the trickiest—yet most addictive—carnival games, the Fish Bowl Game will be a raging hit with your guests, young and old alike. Line up 10-20 small fishbowls close together in rows on a table. Give your festival-goers a bag of pennies or Ping-Pong balls, and sit back and watch while they tirelessly try to land them in the fish bowls one by one. A carnival party can’t get any more authentic than a good ol’ game of ring toss! To get in on some traditional fun, fill up a plastic crate with rows of empty, upright glass bottles. (Make sure the long bottle necks stick out high above the rim of the crate.) Hand the kiddos a bunch of colorful plastic rings and enjoy their laughter as they compete to see who can loop the most rings around the bottles. The ultimate carnival guessing game is also the easiest to recreate at home. Fill up a large jar to the rim with jelly beans, seal it and place it on a table for all to see. Have everyone guesstimate how many beans are in the jar, and reward the closest guess with a prize. Bonus: Once the game is over, everyone can dig into the delicious jelly beans! Carnival party guests will have a quack-tastic time fishing for prizes! Grab about 50 rubber ducks (the weighted kind float best), label the bottom of each duck with the name of a toy, and attach a hook to the top of each duck’s head. Fill a small plastic kiddy pool with water, toss in the ducks and have the little ones cast a line and try to nab the biggest prize. What other kinds of fun food and activities will you have at your kids’ next carnival party? Whether your dad’s a handyman, a top chef or a sports fanatic, no one wears as many hats as he does. So this Father’s Day, let Pops sit back and enjoy the holiday in his own way! Don’t get him just any gift; treat him to something that he can not only devour, but also use for his favorite relaxing hobbies. Here are some practical and delicious Father’s Day gifts for every kind of dad! After a long week at the office, there’s nothing quite like heading out to the golf course to recharge Dad’s batteries. If teeing off is your father’s favorite way of loosening up, surprise him with a golf-themed gift he can use every time he feels like hitting a few rounds. From fishing, to barbecuing, to cheering on his favorite sports team at the stadium, your dad looks forward to doing anything that lets him breathe in the fresh air of the great outdoors. Give him a present that he can take anywhere he goes, whether it’s on a boat or in the stands. No leaky faucet is a match for this Mr. Fix-It! If your dad’s idea of weekend fun is hunting for new repairs to make around the house, then stock up his tool shed with a few new accessories, like a bucket for his collection of nuts and bolts, or a pail to organize his hammers and screwdrivers. POW! Nothing re-energizes Dad more than putting up his feet and flipping through his stacks of vintage comic books. Help him indulge his passion—and show him what a super-dad he really is—with colorful hero-themed treats that he can munch on whenever he reads his favorite comics. What’s your dad’s favorite way to wind down, and what kinds of hobby-related gifts will you give him this Father’s Day? Looking for a special gift for an outstanding grad? You don’t have to settle for a boring present that’ll end up buried somewhere in your alum’s closet. Give her something unique and delicious that she’ll devour in seconds and remember forever: cookies! Here are three yummy alternatives to traditional graduation gifts for the star student in your life! What’s the first thing you hand to your grad after she marches down the aisle? Flowers, right? Well imagine her surprise when you greet her with a bouquet of cookies instead! In this fun twist on a typical graduation gift, Cheryl’s world-famous buttercream frosted cutout cookies and crunchy hand-decorated shortbread cookies are artfully arranged in a silver pail to look like beautiful blooms. It’s the irresistibly sweet way to say “Congrats!” for a job well done! If you can’t make it to the graduation ceremony but still want to send your best wishes for a successful future, skip the conventional card and send your favorite grad a cookie greeting! 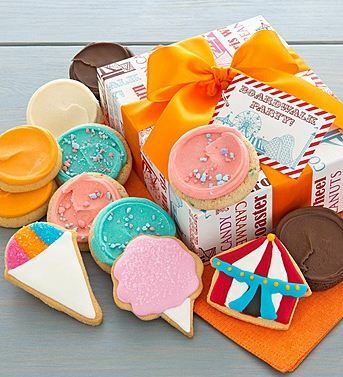 A mouthwatering buttercream-frosted cutout cookie comes in an adorable gift box, which you can customize with your own personal message. Plus, it comes with a $5 Cheryl’s rewards card! A deliciously heartwarming message on her special day, and a rewarding future to look forward to. What more could a grad want? A college graduate can only have so many T-shirts with her alma mater’s logo on it. Give her another fun way to show her school spirit with these awesome college gift towers and cookie tins! 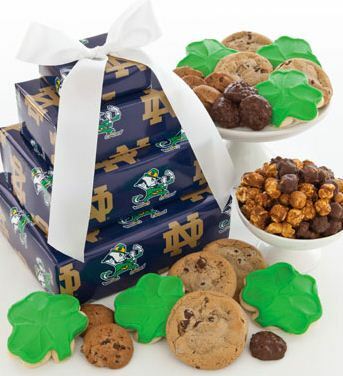 Whether she graduated from Ohio State University or the University of Notre Dame, these exclusively frosted and packaged cookies will make her proud to flaunt her school colors. A tasty reminder that no matter where the road to her future leads, she’ll always be a part of her college’s family! What other kinds of unique graduation gifts will you give to your proud grad? 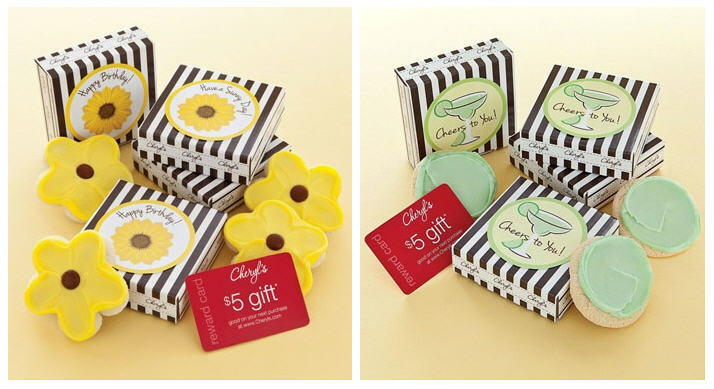 At Cheryl’s, we’re always looking for new and fun ways to celebrate all of life’s special moments. There is always so much to congratulate our friends and families on from new jobs, promotions, engagements, graduations, or even a just because gift to pick their day up. We know that this can get to be a little overwhelming trying to find something for everyone (let alone finding anything at all! ), so we’ve decided to take on one of our favorite gifts and make your gifting ideas and option a whole lot easier! We believe every celebration can be sweetened with our famous cookies, and now we have the perfect gifts that everyone can enjoy (including your budget!). 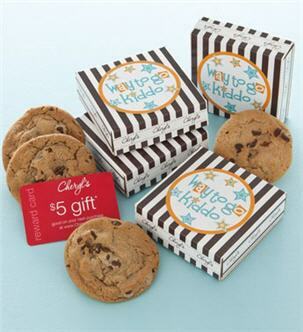 Our all new $5 Cookie Greetings are designed for every playful and thoughtful occasion you have coming up. Sweeter than a card and only $5 delivered, we know these delicious cookies will be appreciated. Each cookie greeting comes with a $5 reward card for your recipient to use on their future purchase, making it the gift that keeps on giving! These delicious greetings are designed for graduations, anniversary, and “Happy Birthday”, get well, congratulations, “Thank you”, “Cheers to you” and more! Check out our new collection here and tell us what you think. 6 days ago by cherylscookies Our Peanut Butter Frosted Buckeye cookie is a rich chocolate cookie mixed with creamy peanut butter and loaded with chocolate chips and mini peanut butter cups! We top this amazing cookie with our delicious peanut butter buttercream frosting and sprinkle more mini peanut butter cups on top! 3 days ago by cherylscookies Wishing everyone a Happy Easter!